Harsh Mishra, 45, left a teaching position in strategic management at the State University in New York to join Management Development Institute (MDI), Gurgaon, last August. “And beyond the social and family comforts, as a professional you have the opportunity to be part of institution-building in India," says Mishra, who taught for 12 years in the US before shifting to India with his wife and two children. He claims his move to India had nothing to do with the recession in the US as it didn’t affect the teaching profession much. Manoj Kumar, 36, a biotechnology and genetic engineering specialist, quit his job at a research laboratory in Victoria, Australia, to join Jalandhar’s Lovely Professional University (LPU) five months ago. He cites three reasons for his move: economic instability in Australia, the fear of losing his job, and better opportunities in India. “The education sector (in India), especially the private sector, is imbibing corporate culture," says Kumar, who spent nearly five years in Australia as an assistant professor. He says his salary in India is “quite exciting", though not on a par with his previous job. For students such as Neelanchal Vaid, a fourth-semester BTech student at LPU, faculty members with international teaching experience bring a lot of practical knowledge to the classroom. “I am a biotechnology student and Mr Kumar with his R&D background helped me to get an in-depth understanding of a few subjects." MDI director B.S. Sahay says they have 10 permanent faculty members of Indian origin who joined the institute after teaching abroad for a while. However, the number of faculty (of Indian origin or foreigners) coming to teach for shorter periods, such as a semester (around six months) or less, is much higher. He believes India offers better exposure and opportunities in joint research. 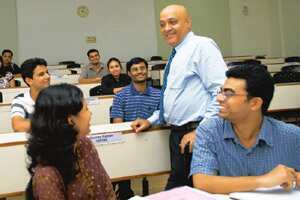 While academics such as Sitaram Rao Yechury, 44, an associate professor of electrical and electronic engineering at Sharda University in Greater Noida, Uttar Pradesh, believe that most enjoy returning to a “better social life" and the chance to participate in institution-building, education experts from the Federation of Indian Chambers of Commerce and Industry (Ficci) and Ernst and Young say hiring such faculty members also helps lesser-known institutes build a brand name and allows students to benefit from their wider experience. “Sure, these faculty bring quality teaching and international exposure for students. But it also helps the branding of the institutes through their names," says Shobha Mishra Ghosh, director of Ficci’s education wing. Adds Amitabh Jhingan, partner, education sector leader, Ernst and Young: “Those who are coming to India, I believe, are (opting) for a greater global exposure. This will enrich them and, for sure, Indian institutes can benefit from their experience." However, such hiring may not be enough to meet India’s acute faculty crunch. According to data available with the human resource development (HRD) ministry, India has 472 universities, 22,000 colleges and thousands of other technical institutions. The number of colleges and technical institutions has increased by nearly 25% in the last five years. The HRD ministry estimates that the country will need 803 more universities and 31,830 more college-level institutions in the next 10 years. Around 12 million students in the 18-24 age group are pursuing higher education in the country and the number is expected to rise to 42 million by 2020, the ministry says. There is no official estimate of the number of teachers India will need by 2020. Going by a rough estimate that IITs follow, the country will need around 4.2 million teachers to teach 42 million students at the higher educational level. In the past two years, Sharda University has hired nearly 25 faculty members of Indian origin and expats (five of them are foreigners). This year, it has sent out offer letters to another 60, says P.K. Gupta, chancellor of the university and a member of the Education Promotion Society for India. “Looking at the economic crisis in some countries in the West, we believe many of them will join us by year-end," says Gupta. He says the university offers $5,000-6,000 (Rs2.3-2.8 lakh) per month to faculty members of Indian origin who join as associate professor. Indian professors with no international exposure earn around 40% less.